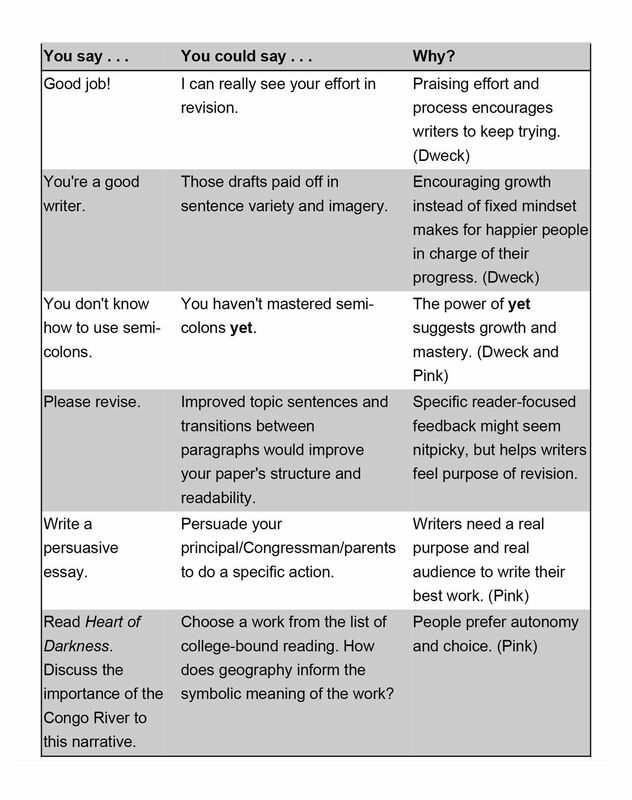 To engage your students with their own development as writers, motivate them to care by showing your own interest and engagement with their process. It's the first writing conference, four weeks into the year, with this blond senior. He stiffly leans back from me as far as the metal desk will allow, exuding cynicism, too cool for meeting with teachers about his writing. I can see he doesn't trust me yet or know why we conference, and he's afraid. He says, "So, what is this meeting about then?" And we begin. Conferencing and portfolios work for me. Over the last 13 years of teaching English, I've developed a system of folders for work, held regular quarterly conferences with every student, and instituted cover letters in which students introduce, explain, and critique their writing at the end of the year. I also teach California State University's Expository Reading and Writing Course, a curriculum for high school seniors that encourages teachers to coach writing and students to write for real audiences. 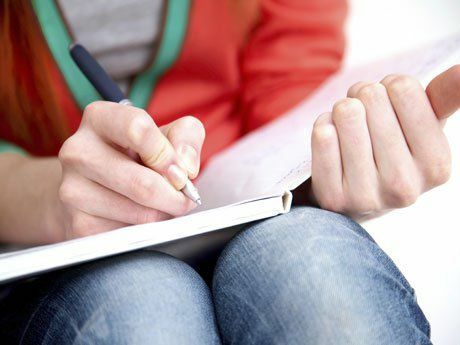 After the course, students report growth in their writing -- new confidence, success in their next-year college classes, higher EPT scores, and perhaps most importantly, ownership of their writing. Scholarship from the 1980s to the present supports my own findings and reiterates that portfolios and writing conferences can sometimes be very successful. But I wish the research would point to these systems as consistent and universal means of student growth. It does not. The research suggests that these practices improve student writing only along with the qualifier of enthusiastic teachers who create meaningful systems for their own classrooms. It worked in my classroom, but I was bothered that the research was so tepid. I kept doing portfolios and conferences in my classroom, noting anecdotal and statistical success for my students. Then, two years ago, I read Daniel Pink's Drive and Carol Dweck's Mindset, and I realized that a system of portfolios and conferences was not enough to change student engagement on its own. The way I thought and talked with my students about their writing and learning had also changed. The words out of my mouth in the classroom changed the way students thought about their writing even more than portfolios and conferencing. Pink’s Drive argues that employees -- and students -- after their basic needs are met, are motivated by autonomy, purpose, and mastery. Humans want some control over our tasks, we want real tasks that connect to our world, and we want the opportunity to improve. Extrinsic motivation (grades, bonuses, stickers, prizes) actually inhibit students from succeeding on cognitively difficult tasks like, say, writing. I'd been teaching writing all wrong! I'd dangled the carrots of prizes and threatened with the sticks of docked points for misplaced modifiers. But sometimes, I also got it right. Before, I'd let students choose prompts and readings as much as possible, providing autonomy. After reading Pink, I learned to unbend myself, make deadlines more flexible, and shape the writing process more to fit the student. Now, my students feel more control over their process. Before, I'd encouraged my students to write for real audiences as summative assessments. Now, I encourage students to write to real people for real purposes throughout the school year -- their own blogs, each other, me, their principal, their Congressional representatives, and the world. Before, I'd embedded grammar instruction in writing process and had students keep their work to casually notice their progress once a year. Now, I conference four times a year with students about portfolios of their work -- an ongoing conversation about writing goals of their choosing. I explicitly teach metacognition, or how to talk and write about their writing. Carol Dweck’s Mindset also made me question the feedback I was giving. Dweck found that praising students for intelligence actually made kids less likely to take academic risks because, on some level, they feared losing the label of "smart" if they did poorly. And since avoiding academic risks means avoiding learning, praising students' intelligence eventually impaired their success in school (and life happiness as well, since they felt intelligence was out of their own control). Students praised for working through difficult material wanted to show they could do so again, with the cumulative effects of long-term academic success, confidence in trying situations, and happier outlooks. Dweck called these mindsets fixed and growth, and started a movement to instill growth mindset in students. She has also talked about the amazing power of yet. She argues that we do a disservice to students by giving them only positive feedback on their writing. Although we don't want to crush their dreams, they can handle -- and even need -- room for growth and mastery. Hence the power of yet: "Your sentence structure does not yet match the tone you are trying to achieve." Yet allows negative feedback while also transmitting trust that they will get there. 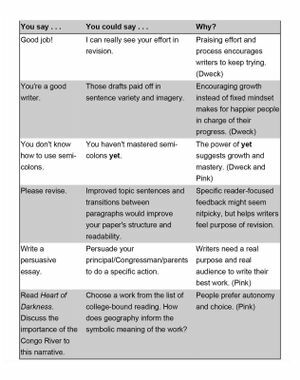 I had a realization several years ago that my goal is not a good essay from Student A, but rather for Student A to know that she's in charge of her progress as a writer and feel confident to keep writing for the rest of her life. To that end, I must teach writing process, self-confidence through intrinsic motivation, metacognition, and the willingness to write badly, much more than I need to teach themes, metaphor, or prepositional phrases. Reading the Common Core Language Arts documents and support, one notices the words "choice," "audience," "purpose," "metacognition," and "growth" throughout. Recently, I presented nurturing intrinsic motivation in writing to a classroom of other educators. They had no problem brainstorming ways to improve intrinsic motivation and growth mindset in our classrooms. Students want the same freedom in writing that we do, and teachers know how to provide it when given the opportunity. It's the fifth meeting since September with that blond senior. Now his knees are tucked under him so he can arch across the desk and dissect the same sentence a foot away from me. We have gone from a distant "What is this meeting about then?" to an eager "Can I schedule a conference right now? I think I've smoothed the transitions, but I need to play with the syntax in the conclusion. Hear me out." Perhaps more importantly, I didn't schedule it, and I'm not doing most of the talking. He's found his voice and his reason to write.